Hayley Snow looks forward to reviewing For Goodness Sake, a new floating restaurant that promises a fresh take on Japanese delicacies like flambéed grouper with locally sourced seaweed. But nearby land-based restaurateurs would rather see their buoyant competition sink. Sent to a City Commission meeting to cover the controversy, Hayley witnesses another uproar. The quirky performers of the daily Sunset Celebration are struggling to hold onto their performance space. The fight for Mallory Square has renewed old rivalries between Hayley’s Tarot-card reading friend Lorenzo and a flaming-fork-juggling nemesis, Bart Frontgate—but things take a deadly turn when Bart is found murdered. 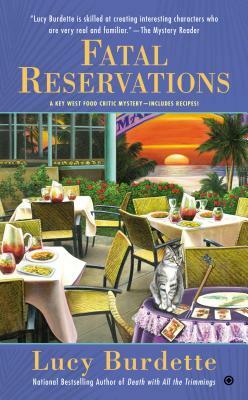 Clinical psychologist Roberta Isleib, aka Lucy Burdette, has had thirteen previous mysteries published, including Death with All the Trimmings, Murder with Ganache, and Topped Chef in the national bestselling Key West Food Critic Mystery series. Her books and stories have been short-listed for Agatha, Anthony, and Macavity awards. She is a past president of Sisters in Crime.